Electric motors are used by a wide variety of our dry bulk materials handling and materials processing customers like aggregates, asphalt, and concrete, chemical processing, food processing, foundry and metal fabrication, glass, paint, plastics and rubber manufacturers, textile mills, grain, feed, fertilizer, seed, lime, mining, power, pulp & paper, railroad, and recyclers just to name a few. To meet the needs of our diverse customer base, we offer a wide variety of general purpose premium efficiency electric motors and IEEE-841 electric motors with TEFC (Totally Enclosed Fan Cooled) enclosures, severe duty large frame electric motors, and premium efficiency explosion proof electric motors with TEXP (Totally Enclosed Explosion Proof) enclosures. We also offer shaft mount gear reducers and worm gear reducers, motor mounts, motor controls, temperature sensors, and other components, accessories, and options for your operation’s unique needs and environment. 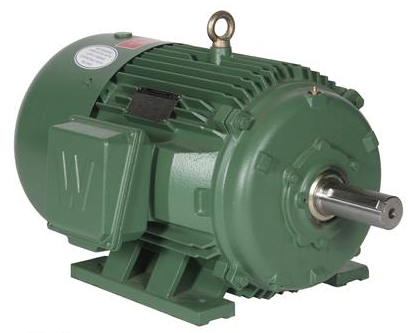 If you operate blowers, bucket elevators, centrifugal pumps, compressors, conveyors, dust collectors, farm equipment, feeders, food processing equipment, hoppers, material handling equipment, packaging machinery, recycling equipment, screeners, screw conveyors, separation equipment, shakers, vibrating screens, etc., then great quality electric motors with all the necessary certifications keep your operation running optimally! This entry was posted in Uncategorized and tagged Aggregates, asphalt, blowers, bucket elevators, bulk handling, centrifugal pumps, chemical processing, compressors, Concrete, construction, Conveyors, dry bulk material handling, dust collectors, Electric motors, farm equipment, Feed, Feeders, Fertilizer, Food Processing, foundry, Glass, grain, Hoppers, Lime, Manufacturing, Material Handling, material processing, metal fabrication, mills, Mining, motor controls, motor mounts, Packaging, paint, plastics, Power, premium efficiency electric motors, pulp and paper, Railroad, recycling, rubber, screeners, screw conveyors, seed, separation equipment, shaft mount gear reducers, shakers, TEFC, Temperature Sensors, TEXP, Textiles, totally enclosed explosion proof, totally enclosed fan cooled, utilities, vibrating screens, Wastewater, worm gear reducers. Bookmark the permalink.